*A blog written by a character who appears in the novel The Wayfarers: Revised Edition. Read the book in Kindle, Kindle Unlimited, or paperback, and you’ll discover who this enterprising and beguiling man is. The world is mine. What I say is so, because I am the leader you have waited for! I bring peace and prosperity, and a new world vision. We are one, people – I said we are one! Repeat after me: WE – ARE – ONE! Christian bigotry will not be tolerated, and the Bible is outlawed. Beyond that, there will be no more religious intolerance because you all worship the same spirit of the same god. You might call him Allah, but that is not quite right. You might call him Buddha, but that isn’t accurate. But whatever you do, do not mention the name of Jesus in my presence, or you will meet the death kiss of my wrath! And true, we are one world, but I had better not hear of any FM stations playing that insipid former MTV staple We Are the World. That song is worse than the drivel that was played on K-LOVE before I had that “positive and encouraging” rubbish taken off the air! I am suave, sophisticated, devilishly handsome and possessed of acute intelligence. I am an economic mastermind and a peacemaker extraordinaire. I have all the answers to the world’s problems because simply put, I am the answer! Ah, pardon my sarcasm, but do those statements smack of a lack of humility? America is no longer a superpower, but instead a part of the North American Union; which is one of my 10 kingdoms. 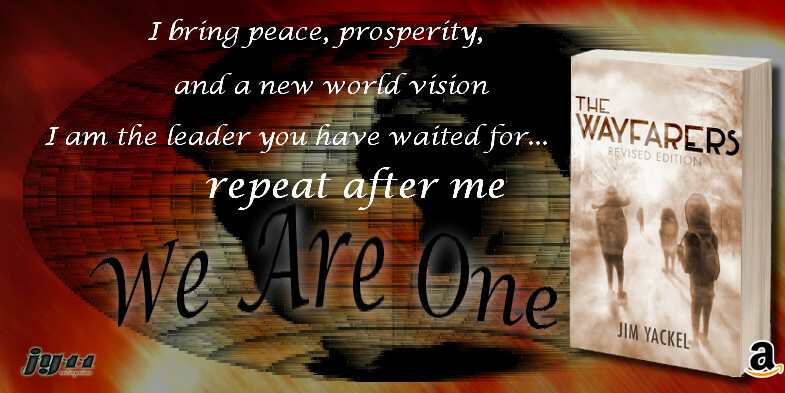 Yes, the world is now a better place because we are one, WE – ARE – ONE! Now that those Jesus freaks were taken away by our friends from a distant planet – to whom we owe a debt of gratitude – we can be one government, one religion, one economy, and one world united in peace! Repeat after me, WE – ARE – ONE! This is far too easy. I have the world in the palm of my hand, and when I say jump you all should ask “how high?” And ah, yes, it seems like the citizens of the erstwhile U.S.A. are the most Pavlovian of all you dogs! Bow before me, because I am the king of the world, and I am the solution to all the world’s problems.